We drove from Essex to Surrey to shoot the video campaign for Tutti Rouge underwear collection for Autumn/Winter 2013. The location we were shooting in was at an amazing stately house converted private school. The house was beautiful and filled with vintage furniture and props that we ideal to use for the theme of the video. 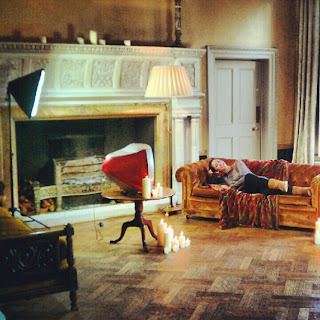 To promote the Autumn Winter collection, the scenes of the video were set to display the holiday season of Halloween, Christmas and New Years Eve. We matched the underwear to the scripted scenes and setting so they would properly suit the holiday they were celebrating. The collection was filled with maroon, cranberry, navy colours which will be trending for 2013. Working with an amazing team, we staged a great shoot that looked amazing on camera, along with a catchy song, excitement of the festive season and a beautiful range of under garments, the champagne video is hoping to be very successful! we used popping pink campaign, balloons, party poppers and indoor snow, the preparation and hard work has lead to an amazing turn out. I shall post the video when it is edited and finished! Here is a link to Tutti Rouge advertising and the website of the on set camera man Paul Bates who made an excellent job of filming.